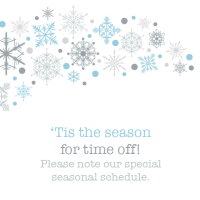 Shoreline Dental will be closed on November 25th, 26th, December 24th and 31st. Keep in mind we’re always closed Fridays! To schedule an appointment, call our office at 206.440.0065 or email us at info@myshorelinedental.com. What are your plans for the holidays? We’d love to hear! Leave a comment below or on our Facebook page at https://www.facebook.com/ShorelineDentalDDS. Our entire team wishes you a safe and merry season!